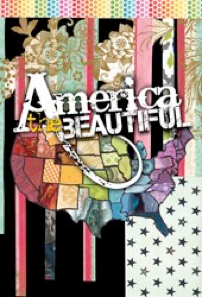 America can be a puzzling place to grow up in – beautiful but ugly, simple but extremely diverse, a land of opportunity but also a land of barriers to that opportunity for so many of its citizens and its visitors. We are bombarded with messages about America almost from the womb. These messages - from school, from our parents, our churches, mosques and temples, our communities but above all from the media - can have a profound affect on who we are, and the kind of American we become. Growing up gay, we receive the same messages as everyone else, but we have a hunch, again almost from birth, that we are in some way profoundly different from other Americans. I remember well the moment in my late teens when, awestruck, I first worked out that being gay would affect everything: all my relationships with every man and woman I met; my career; my approach to religion and spirituality; my ethics and values; and on and on. As members of the LGBTQ community, our journey towards self-acceptance is often full of extra hurdles to jump, extra positions to take about who we are, in relation to an America into which we are not sure we completely fit. This provocative and whimsical show is about that journey. I am also proud that this is also one of the most musically eclectic shows NYCGMC has ever done. There are very few programs on any stage, where Ray Charles will appear with Charles Ives, David Bowie will rub up against Eric Whitacre, and Pat Metheny will be next to Bill Gaither. NYCGMC has always taken choral singing forward into new territory, and we think, done fabulously well, any song can be sung by a choir. So whatever your stylistic bent, we hope you find something to excite you in our program, along with something familiar and enjoyable. As an organisation, NYCGMC remains hopeful about the progress we are making within America institutionally. On marriage equality and so many other issues, we can feel the tectonic plates shifting our way, here in the US and across the world. Yet as I write, a brutal murder in the Village and the uptick in recent hate crime is casting a momentary dark cloud over our image of New York as a safe and tolerant city that celebrates its LGBTQ communities. At times like this it is important both to be vigilant, cautious and steely, and also to carry on as normal. Let’s take the long view and a focus on our successes. Through song, we have definitely made the world a better place in the last 33 years. So we keep singing.